In the high-speed world of Formula One, the slightest error can be the difference – quite literally – between life and death. Push the pedal to the metal for a tenth of a second too long and your race weekend could be over, as you end up hurtling off the track and – if you’re lucky – into a wall of tyres. This is why it’s of absolute supreme importance for any developer attempting to replicate the sport in videogame form to realise that the narrowest of margins matter, and that what would be minor missed steps in other games, have the potential to count as massive stumbling blocks in this particular arena. 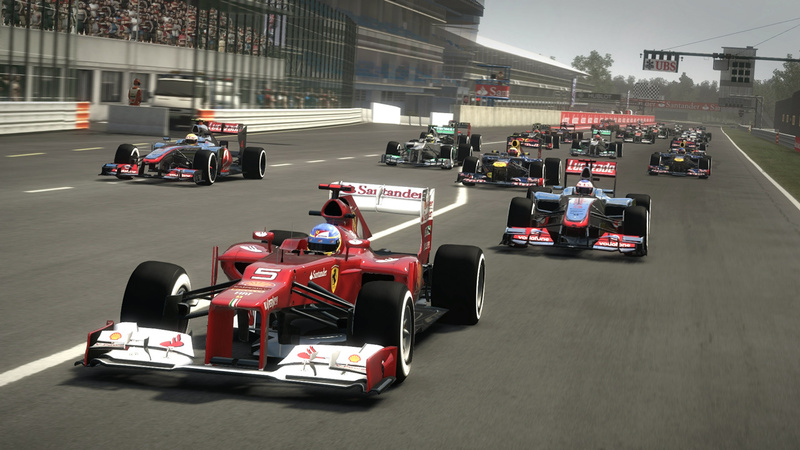 Unfortunately, the areas which Codemasters have chosen to focus on as they’ve made the progression from last year’s F1 2011 are – generally – not areas that needed any massive amounts of attention. The new Test Driver mode – designed to help players who are new to the game – is nice, as is the Season Challenge option – which tasks you with starting at a bottom-end team and working your way up through the ranks by beating driver after driver in a series of best-of-three races. But the focus on the frontend and general structure of the game, as well as the introduction of these new modes, seems to have come at the expense of the on-track action. Scores of minor and major issues from last year’s game still exist in F1 2012, and even though in the grand scheme of things gameplay should always trump graphics, when a game’s graphical performance negatively affects the gameplay that it serves to present, something is wrong. 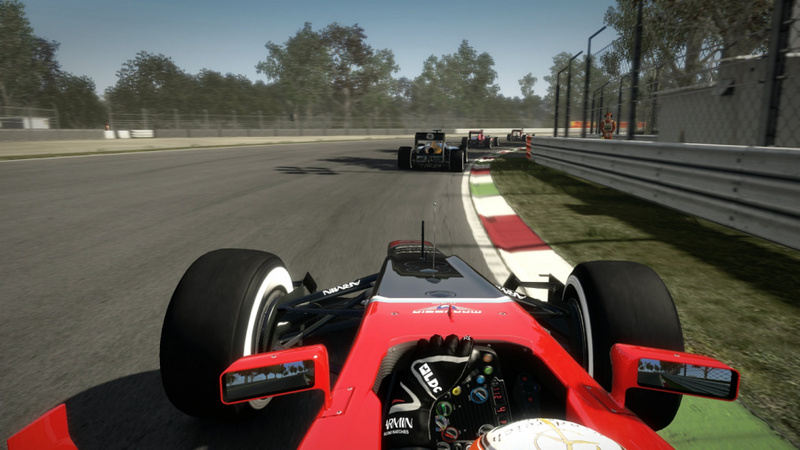 For the second year running, Codemasters’ take on F1 is as smooth as butter on the Xbox 360, but the PS3 edition suffers from frequent and significant framerate drops which – as we’ve alluded to – can be the difference between braking just enough to get around a corner at the optimal speed, and not braking enough, with the result being that your car ends up in a sand trap. 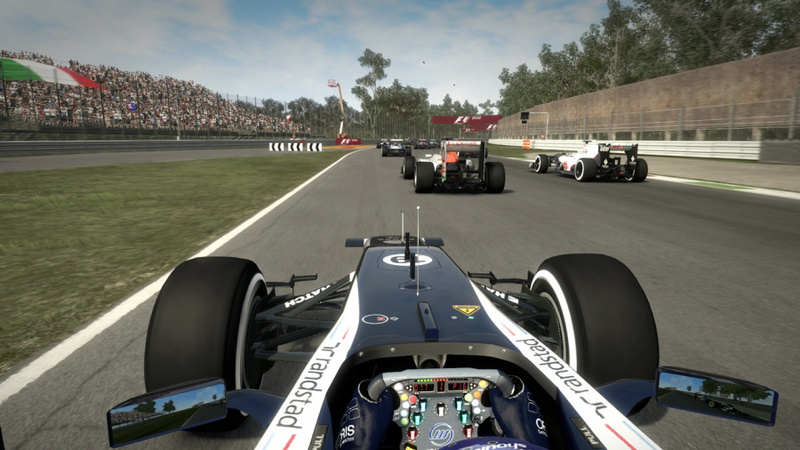 These drops in speed seem to occur not only when a lot is going on – such as when you’re starting a race from the back of the grid and your 23 opponents are all being drawn on screen at once – but also when you’re alone, on the same places of the same tracks. The tight 180 degree final bend at Malaysia can be tricky to negotiate when you suddenly plummet through the 30 frames per second barrier, and the high-speed valley exit at Spa-Francorchamps will have you swearing as you over or understeer thanks to the game throwing a ten frame drop at you just as you were lining up your exit into the straight. On top of that, the penalty system is still terribly flawed. If you’re on the racing line and an opposing driver decides to just steer into you, you’ll get a 20 second penalty for causing a collision – which could be the difference between beating your target position or missing it by two or three places. Also notable is that under blue flag conditions, you pretty much have to stop the car to allow the “faster car” to pass, as the AI driver refuses to drive through the track-wide gap you’ve left them. The result? A penalty for ignoring the blue flags. Aside from that, you’ve still got full-length races where only a single car retires, even after a mammoth crash at the first corner that – yet again – didn’t cause the safety car (whose existence is yet to be confirmed after a full season of play) to be employed. On the higher difficulty levels, AI drivers seem to be hell bent on crashing, frequently trying to get through gaps that just don’t exist. Oh, and the guy on the pit radio is still utterly useless, and frequently annoying. We get it. Our front wing is damaged. We promise that we’ll bring the car into the pits at the end of the lap. There’s no need to tell us five times in forty seconds that you’ve got a replacement ready. 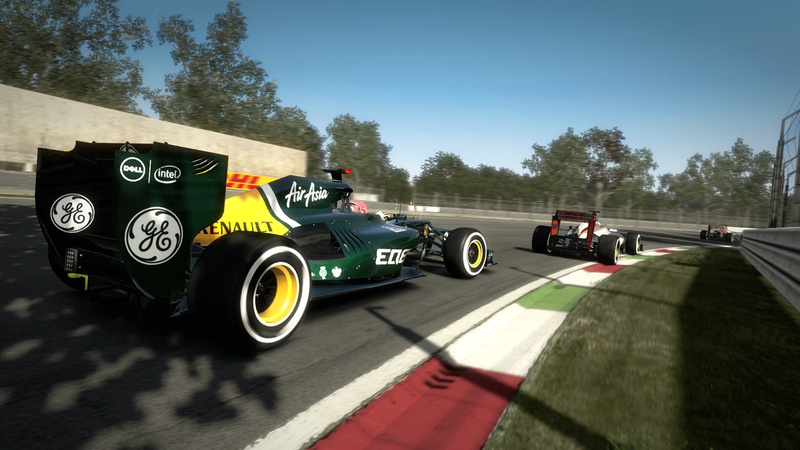 And yet, with all this negative baggage in tow, F1 2012 still manages to be a beautifully punishing game that can take your entire nervous system and vigorously shake it until you don’t know your left from your right. When you’re at the back of the pack in your Marussia, striving to make up a two-second gap in order to beat your 22nd place target, you’ll get fierce and aggressive, suddenly daring to throw the car into corners at maximum velocity and taking extra risks that could end in disaster. When a pile-up causes you to be hurtled into the top six on the first lap, and you know that you’ve got no right to be that far up the listings in your mid-powered Williams, your nerves will become shot to pieces as the laps become longer and every mistake feels like it’s the end of the world as you desperately try to hold on for your first point. When you’re finally in a vehicle that has enough grunt to get you to the head of the line with any sort of consistency, the disappointment of losing out on the fastest lap by just a tenth of a second will cause you to go into the next race with more determination than you thought you could ever muster. The consistency with which this experience is punctured is what prevents F1 2012 from being the absolute last word in console racing. 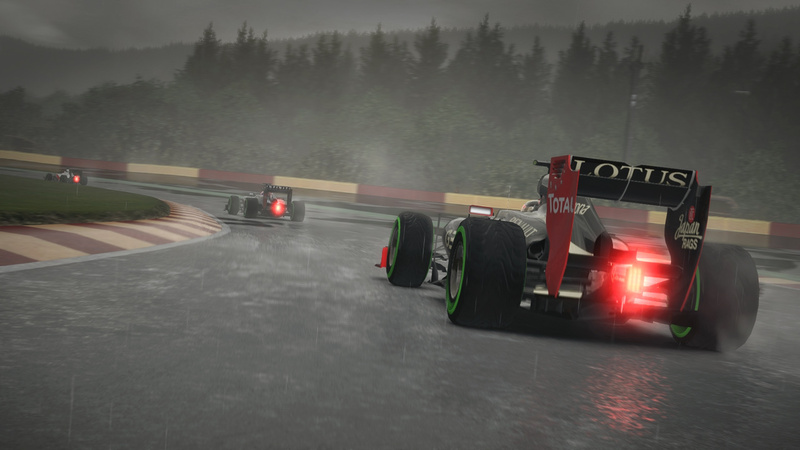 Whether you’re punished by the stewards for causing a collision when there wasn’t even any contact, you lose five positions after a spin that was caused by the game glitching or slowing down, or you’re put out of the race by a greasy surface right after your pit crew advised you that intermediates would be enough and that the rain wasn’t going to get any stronger – it all adds up. If you’re playing full hour-and-a-half races, it really, really burns when one of these issues rears its head three or four laps from home, essentially throwing more than an hour of playing time to the wall. Those margins. Those tiny, tiny margins. They’re the difference between success and failure. F1 2012 is heavily flawed gem. Visually stunning and eminently thrilling one minute, needlessly ugly and overtly annoying the next, it’s a game that really doesn’t do enough to improve over last season’s effort. What’s worse is that fans of the series have been voraciously pouncing on any chance to complain about these issues to the developer for two years now, and they – once again – seem to have been ignored. With that said, the game is just as good as it was last year – just not as good as we'd expect it to be by now. 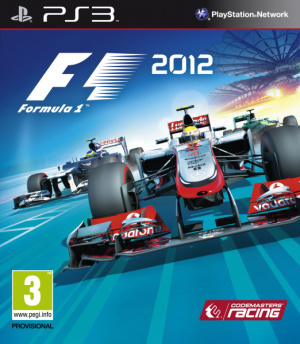 I got F1 2011 on Ps Vita and enjoyed it so I'll probably get this one very soon especially since I'm a fan of F1.